Plymouth Rock News you can use. 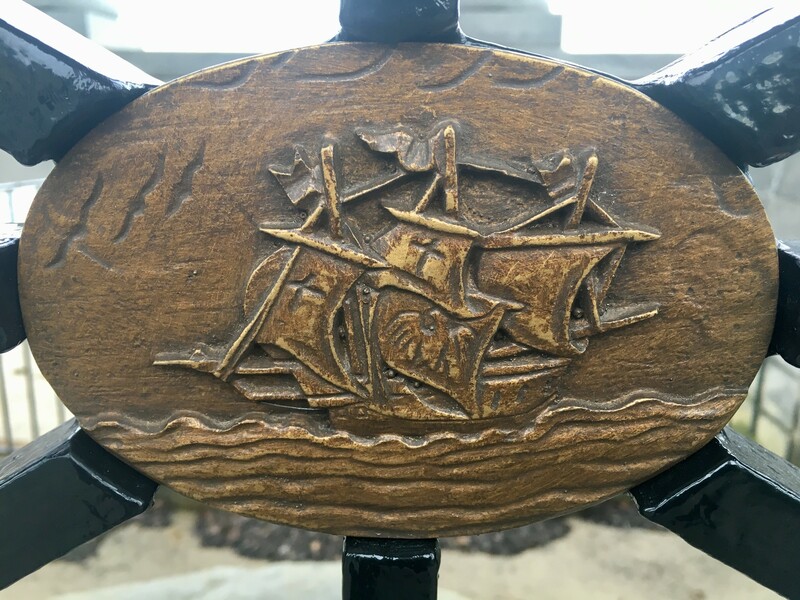 If you plan to visit the Mayflower II take a second to enjoy this little gem at Plymouth Rock. Since April 2017 I have found myself visiting Plymouth Rock for songwriting inspiration. During a recent visit I saw these medallions. They look like they’re made of bronze to me. I could be wrong though. I was amazed with all the detail. In the center of course is the Mayflower, at the top you see puffy clouds, to the left are 3 seagulls and along the bottom is the ocean. I was delighted with this find. I’m sure you will be too. I don’t know who the artist was but I can tell you it was designed about 100 years ago which brings me to a related subject. The Plymouth 400 celebration is right around the corner. I began wondering how many tourists visiting the Rock missed these works of art. I certainly didn’t notice them before. That’s why I wrote this article. There was a time you could take home an actual piece of the Rock. You were offered a hammer and chisel and told, “Take home a piece of history!” Part of the reason Plymouth Rock smaller than expected. You can’t do that anymore but in 2020 you’ll be able to take home this medallion in the form of a pin, brooch, belt buckle and paper weight. Previous post: Happy Forefather’s Day!